On December 5, 2017, the Kingsport Police Department in general, and three of its officers in particular, were recognized for their emphasis on traffic safety over the previous year. At the annual Tennessee Highway Safety Office (T.H.S.O.) Awards Banquet held in Greeneville, TN, the following K.P.D. Officers were presented with awards: Sgt. 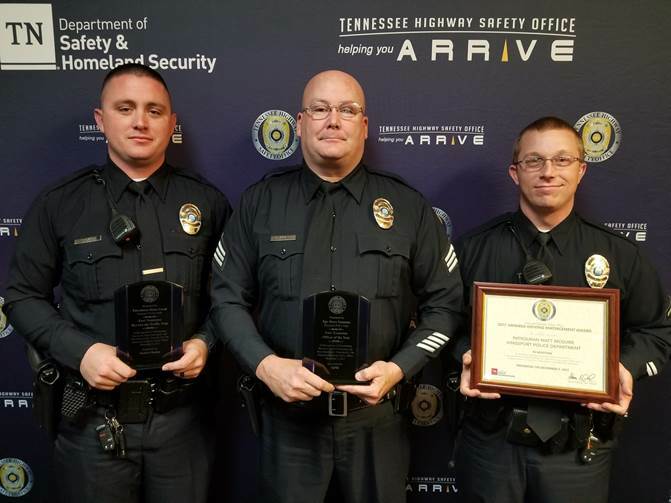 Steve Summey was presented with the East Tennessee Officer of the Year Award, Officer Blake Good was presented with the East Tennessee Beyond the Traffic Stop Award, and Officer Matt McGuire was presented with the Impaired Driving Enforcement Award. In addition to these individual achievements, the Kingsport Police Department as a whole was also presented with a Certificate of Appreciation plaque from the Tennessee Chapter of Mothers Against Drunk Driving (MADD) in recognition for its continued department-wide focus on combating impaired driving. The Kingsport Police Department would like to take this opportunity to applaud the tireless efforts of these officers for helping keep Kingsport’s roadways and citizens safe and to congratulate them on a job well done.